Age 87, of Aiea, HI, passed away February 20, 2017 in Aiea. 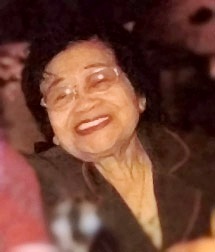 She was born December 8, 1929 in Ilocos Sur, Philippines. She was retired from the Sheraton Waikiki Hotel and was a Eucharistic Minister at St. Philomena Catholic Church. She is survived by son, Patrick (Decy) Belmonte; daughters, Marilyn (Abe) Roldan, Cecilia (Roberto) Gerardo, Mindy (Robert) Ulep; grandsons, Zachary Belmonte, John Paul & Jason Roldan, George & Kevin Gerardo, Robert Allen Ulep, and Robert Clem; granddaughters, Taylor Belmonte and Crystal Lynn Ulep; great-grandson, Jayden Roldan; great-granddaughter, Jaylene Roldan. Visitation 9:00 a.m., Tuesday (April 4) at St. Philomena Catholic Church, Salt Lake. Mass 10:30 a.m. Burial 1:00 p.m at Valley of the Temples Memorial Park, Kaneohe. Casual attire. Flowers welcome.